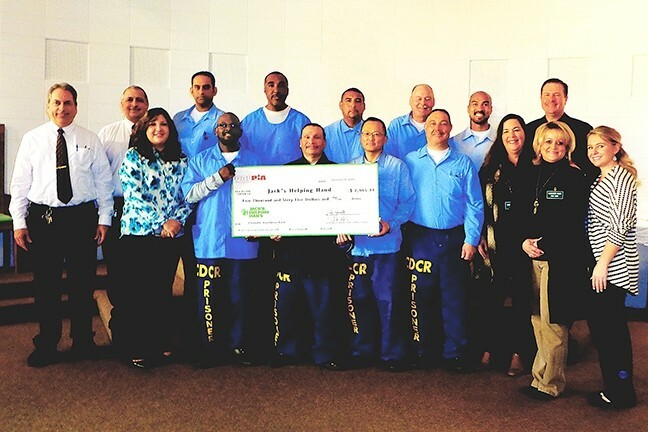 Inmates from the California Men's Colony have collaborated with the California Prison Industry Authority (CALPIA) to raise $2,000 in an effort to give back to their community. CALPIA is a self-supporting business that provides productive work assignments for about 7,000 offenders within the California Department of Corrections and Rehabilitation institutions. Inmates make about 35 to 95 cents and contribute 40 percent of their wages to pay court-ordered restitution and fees. GIVING: Men from the California Men’s Colony presented their donation of $2,000 to Jack’s Helping Hand at an award ceremony. Michele Kane, chief of external affairs for CALPIA said, 169 men from the California Men's Colony that participate in CALPIA pulled their wages together and choose Jack's Helping Hand as the recipient of the donation. More than 60 inmates donated $20 each and one inmate donated $100. She said the men exceeded their goal of about $1,400, which is what they donated to Family Care Network last year. Kane said this is an important story because the inmates decided to come together and give back to prominent community-based organizations on their own. The check was presented to Jack's Helping Hand at an awards ceremony, and Karen Borges, executive director of the organization, was there to personally thank and shake the hand of each inmate that donated. "It's from the heart; they really don't have to give anything but they really wanted to give back to their community," she said. Jack's Helping Hand is a nonprofit organization that assists children with disabilities and cancer under the age of 21. It was created 11 years ago with the notion to help children and their families who can't afford a child's medical needs. The organization helps families with lodging, gas, or food, among other expenses. Borges said that within the county there is a lack of pediatric specialists, and the organization helps families who are not able to fund their child's trip to Los Angeles or San Francisco for doctor visits. She said some parents lose a day of work to take their child to a specialist visit or often quit their jobs to become a full-time caretaker. "I just had a woman call a few hours ago telling me she was going to cancel her daughter's doctor appointment because they didn't have enough money for gas to drive her to Madera," Borges said. "So we got her a gas card." The organization helps an average of 40 to 50 families per month through its assistance program. • SLO County is hosting public meetings for community input on a proposed ordinance to regulate cannabis in the unincorporated areas of the county. Meetings will be held April 5 at the Department of Social Services in Paso Robles, 406 Spring St.; April 6 at the Board of Supervisors Chambers in San Luis Obispo, 1055 Monterey St.; and April 12 at the Nipomo Community Services District in Nipomo, 148 South Wilson St.
• Morro Bay is holding its 14th annual Citywide Yard Sale April 1 and 2. A "treasure hunt" map for buyers of the sale locations will be available at Brenda Sue's Consignment, 248 Morro Bay Blvd. Sellers interested in putting their location on the map can sign up at the Morro Bay Chamber of Commerce, 695 Harbor St., or download the application at morrobaybeautiful.org. Staff Writer Karen Garcia wrote this week's Strokes and Plugs. Email tips to strokes@newtimesslo.com.